태권도 돋보기-이래서 태권도가 좋다Taekwondo magnifier – I like Taekwondo 몸의 균형 태권도가 최고Taekwondo is the best for body balance허리가 아프고, 목이 굽고, 어깨가 쳐지고, 골반이 비틀어진다... Pain on the waist, bent the neck, drooping shoulder and twisted the pelvis대부분의 현대인들은 잘못된 자세와 습관으로 인해 고통을 겪고 있다. 너무나 기본적인 것이라 소홀하기 쉬웠던 자세 속에 신체의 균형을 잡아주는 과학의 원리가 숨어있고, 이 균형이 어긋날 경우 수많은 문제들이 발생하게 되는 것이다. 질병 유발부터 학습능률, 업무능률 저하 뿐 아니라 심하면 인체의 모든 균형이 무너지게 된다. EBS ‘다큐프라임-원더풀 사이언스’는 인간의 몸을 지탱하고 유지하는 자세에 얽힌 비밀들을 파헤쳐 본다. Most of modern people have pain because of wrong posture and habit. It is easy to be careless with the posture for balance of body which is hide the theory of science, there are many problems if this balance is lost. Not only induce the illness and dropping the learning ability and working ability but falling down all balance of the body. 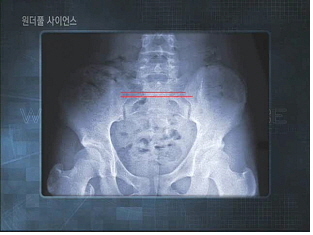 EBS ‘Docuprime-wonderful science’ opens the posture for maintaining the human body.진화의 최고 단계라는 영장류 속에서도 동물과 인간을 구분 짓는 차이점이 있다. 두 발로 걸으며 손을 사용한다는 것은 많은 동물과 구분되는 인간만의 독특한 특성이다. 인간이 두 발로 걷는 직립이종보행을 시작하면서 골격에도 큰 변화가 생겼다. 무게중심 변화에 따라 각 부분의 지지체계도 달라진 것이다. 이처럼 오랜 진화를 거쳐 안정적인 직립보행을 하게 된 동시에 평생 지구의 중력을 거슬러 싸워야하는 숙명을 떠안게 되었다. 직립보행과 자세의 관계를 알아보고 현대인들이 안고 있는 몸의 지지구조에 미치는 자세의 크고 작은 영향을 살펴본다. There is the difference between animal and human in the high level of evolution, the Primates. Standing with two feet and using the hands that is the unique specific of human divided with animals. The skeleton has been changed when human started walking on two feet. Each part of the supporting system also changed by the change of the center of gravity. So the human could walk erect in stable passed through evolution for long times but at the same time, it had to fight the gravity of the earth. Find out the relation of the walking erect and posture and see the posture of big and small influence to effects the support system in the modern person’s body. 잘못된 자세가 부르는 환경병 Bring the environment illness by the wrong posture현대인들은 컴퓨터의 등장 이후, 등과 목이 구부러지는 자세를 자주 취하게 된다. 하지만 원래 인간의 몸은 이런 외부 상황에 대처하도록 만들어졌다. 성인의 경우 앞을 향해 휘어진 목, 뒤로 크게 휘어진 등, 다시 앞으로 휘어진 허리로 S라인이라 불리는 척추를 갖게 되는데 이런 세 개의 만곡은 척추에 가해지는 중력을 분산시키는 중요한 역할을 한다. 몸을 보호하기 위해 태어날 때부터 갖고 있는 이 지지구조에 문제가 생기면 우리가 흔히 디스크로 알고 있는 추간판 탈출증, 성장기 청소년에게 많이 나타나는 척추측만증, 여성의 경우 높은 신발을 자주 신을 때 나타나는 척추전만증 등 다양한 질병이 발생하게 된다. 우리가 무심코 취하고 있는 자세가 불러오는 신체의 변형을 살펴보고, 이를 예방하기 위해 생활 속의 잘못된 자세들을 소개한다. The modern persons often posed the bent back and neck after using the computer. But originally the human body is made to deal with this outside conditions. In case of adult, it has a bent neck forward to front, big curve on the back and curve on the waist that backbone called S-line, this three curves have an important role to spread the gravity on the backbone. We have this support system for protecting the body when we were born but if there is a problem on this support system, various diseases will start like intervertebral disc, scoliosis for teenagers and lordosis for woman who wear high heel often. It looks into the transformation of the body by the postures and introduces the wrong postures in life to prevent this.스포츠 경기에서는 찰나의 순간, 혼신의 힘을 쏟아 만들어낸 결정적 동작이 승패와 최고의 기록을 결정한다. 스포츠에서도 정확한 자세가 결과에 영향을 미치는 가장 큰 변수이자 공략 포인트인 셈이다. 최고의 동작과 힘을 내기 위해서는 근원이 되는 근육의 힘을 키워야하기 때문이다. 하지만 근육의 힘은 균형 잡힌 신체에서 나온다. 하지만 운동의 특성상 주로 습관이 된 부분의 근육만 사용하다보니 좌우균형이 깨지면서 문제가 발생하기 쉽다. 균형 잡힌 자세와 스포츠에 미치는 영향을 알아보고 핵심요소임을 확인해 본다. The decisive actions with the whole body power in a second decide the issue and the best records at the sport game. The right posture is the big variable and strategy point for the result at the sports. It has to train the power of muscles for the best movement and power. But the muscle’s power comes from the balanced body. But it is easy to use a convenient side by the specific of exercises so it has the problem by losing the balance of the left and right side. Inquire the effect of balanced posture and sports and checking as a core element. 태권도의 예Example of Taekwondo균형잡힌 자세는 신기록 갱신 뿐 아니라 최대의 공격력을 발휘하는 데에도 반드시 필요한 요소이다. 우리의 대표적인 무술인 태권도 수련도 균형잡기로부터 시작된다. 모든 무술에는 동작과 그에 따르는 반동작이 있어서 이를 어떻게 제어하느냐에 따라 공격력이 결정된다. 태권도의 기본 자세인 발차기의 경우 강하게 발을 차고, 빠른 속도로 돌아와 균형을 잡아야 성공적인 동작이다. 발을 찰 때도 공격하는 쪽과 반대쪽의 균형을 잡고 몸의 힘을 균등하게 배분해야 강한 공격력을 낼 수 있다. The balanced posture is necessary cause to renew the new records and display the best striking power. Our representative martial art, Taekwondo training is also started from the balance. All kind of martial arts have action and reaction so the striking power is determined by how to control it. For example, the basic posture of Taekwondo, kicking has to kick hard and return fast with balance that is the success movement. It becomes a strong striking power by distribute the power of body in the balance when kicking.한 체육관 관장은 “옆차기는 무릎을 올렸을 때에 모든 힘이 바로 이 디딤발에 있습니다. 힘을 디딤발에 주고 차는 발을 뻗었을 때 엉덩이가 빠졌을 경우는 힘의 분배가 뒤로 가게 됩니다. 하지만 엉덩이를 집어넣을 경우, 허리와 골반이 일직선이 되었을 때 옆차기의 모든 힘이 엉덩이로 빠지지 않고 다리로 가기 때문에 타격률이 더 강합니다” A Taekwondo master said, “When the knee bends up for the side kick, the strength is on the foot on the ground. When the leg straighten for kick but hip is not straight, the strength goes to the back side. But when the hip is straight and then waist and the pelvis are straight, the all strength of side kick goes to the leg instead of the hips so the striking average can be strong”골반을 중심으로 상체와 하체, 앞과 뒤의 무게가 가장 균형있게 배분될 때 가장 강한 공격력을 낼 수 있다는 것이다. 이렇게 균형이 잡혀있을 때 기본발차기를 응용한 뒤차기나 돌려차기 등 고난이도 동작도 성공할 수 있게 된다. When the upper and the lower part of the body, the weight of front side and back side are balanced from the pelvis, it put out the strong striking power. When it is balanced like this, the high level kicks like a back kick or round kick can be succeeded. 서영준 모 한의원 원장 “결국은 이상적인 중력의 분배를 해야만 중심을 가지고 공격과 방어를 적절히 행할 수가 있습니다. 이를테면 무협소설에 등장했던 외팔이 검객은 누구보다 힘든 동작을 시행할 수 있는 거죠. 오른손으로 칼을 뽑아서 앞으로 시연할 때 정상적인 경우에는 왼손의 힘은 아주 중요합니다. 힘의 분배를 달리하더라도 칼을 들고 있지 않은 왼손 힘의 분배는 아주 중요한 위치에 작용하는데요, 한쪽 팔이 없는 검객의 경우에는 한 팔로 (검술을) 시행하는 동작에서 온몸의 중심을 지키기 위해 다른 부분의 균형이 필요하기 때문에 사실은 한쪽 팔로 시연하지만 전체적인 균형 잡기는 사실 쉬운 것이 아닙니다. 결국 상하와 좌우의 균형이 맞는 지점에서 행하는 게 제일 효율적이고 파괴적인 힘을 낳을 수 있다고 생각합니다.” Mr. Seo Young-Jun, the director of the Oriental medicine clinic said, “After all, a perfect sharing of gravity can act attack and defense pertinently with the center. For example a one-armed swordsman in the heroism fiction can act a difficult movement better than anyone. Normally the strength of the left hand is important when drawing a sword. The sharing of the strength for the left hand is very important even through it doesn’t hold the sword. In case of the one-armed swordsman, he uses a hand for the swordsman movement but that is not easy because it needs a balance of different part for taking a balance. So it is the best effect to act on the balance point of the top and bottom and the left and right for making destructive power.”상대와의 결전보다는 찰나의 미세한 공간 속에서 자신의 몸과 먼저 싸움을 벌이는게 무술인 셈이고, 끊임없는 수련을 통해 상체와 하체, 전후좌우, 자신의 몸을 완벽히 균형잡을 수 있어야 비로소 고수의 경지에 이르렀다고 할 수 있게 될 것이다. It is more important to train oneself than match with opponent that is the martial art, and then it can be close to the master level when the body balance is perfect on upper body and lower body, front and back, left and right by endless training. 태권도, 요가와 같은 대칭적인 운동은 신체의 균형을 유지시키면서 근력, 순발력 등의 체력을 육성할 수 있는 운동이다.The symmetrical training like Taekwondo and Yoga keeps the balance of body and bring up the physical strength.